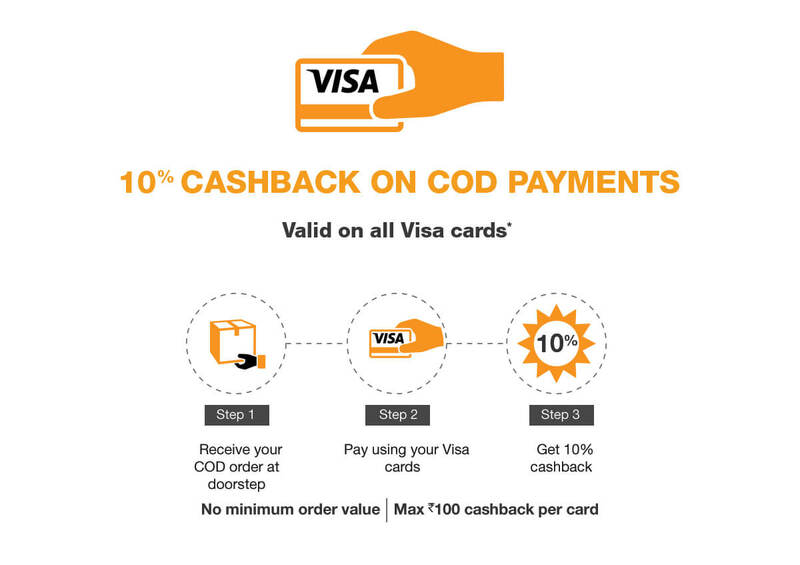 Amazon Visa Cards COD Orders 10% Cashback. CoupenYaari bringing back the habit of saving big. Get fabulous deals on a wide range of over 5 crore products ranging from Electronics, Household supplies, Clothinge, Groceries & more on COD. Pay using Visa cards when you get the order and enjoy 10% cashback. No minimum purchase require. Maximum cashback is Rs. 100. Subscribe Amazon Prime Free for 60 days to get free shipping or add any Amazon Fullfilled book with product to get free shipping on cart below Rs. 499. This offer (“Offer”) is provided to you by Visa Inc. (“Visa”) and is made available by Amazon Seller Services Private Limited (“Amazon”). It is open to all residents of India holding a valid and current Visa credit and/or debit card (“Eligible Card”) issued in India by any bank (“Cardholder”). The Offer is valid from during the Offer Period, unless extended by Visa and/or Amazon at their sole discretion. The Offer is valid only for customers paying with his/her Visa debit/credit/prepaid card at the time of delivery. The maximum value of an Amazon.in GC provided under this Offer will not exceed Rs. 100 per Eligible Card. Visa and Amazon reserve the right to disqualify the Cardholder(s) from the benefits of the Offer, if any fraudulent activity is identified as being carried out for the purpose of availing the benefits under the said Offer. Visa and Amazon reserve the right, at any time, without prior notice and without assigning any reason whatsoever, to add/alter/modify/change or vary all of these terms and conditions or to replace, wholly or in part, this Offer by another offer, whether similar to this Offer or not, or to extend or withdraw it altogether. Delinquent and over-limit Cardholders will not qualify for this Offer. 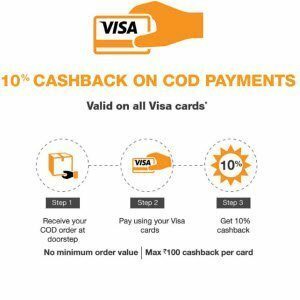 How to Get Amazon Visa Cards COD Orders 10% Cashback? Select a delivery address and Continue. On step Select a payment method, scroll down and select COD. When your COD order arrives, you may ask for availability of the card accepting machine. If the card accepting machine is available and you make the payment via a Visa card during the offer period using the card accepting machine, you will be eligible for the cash back. Pay for your cash on delivery orders using any Visa card (credit or debit card or prepaid card) and get 10% cash back in your Amazon Gift Card account (up to Rs. 100. Pay for your cash on delivery orders using any Visa card (credit or debit card or prepaid card) and get 10% cash back in your Amazon Gift Card account (up to Rs. 100). Payment is to be made by using the card accepting machine carried by the delivery associates. This Offer is valid for COD payments made during the offer period. When your COD order arrives, you may ask for availability of the card accepting machine. If the card accepting machine is available and you make the payment via a Visa card during the offer period using the card accepting machine, you will be eligible for the cash back. Usage of the card accepting machine is subject to availability. There are no other special steps to avail this Offer. Just go through the normal purchase process. What is the cash back that I can get? How and when will I get the cash back? The cash back will be credited in the form of Amazon.in gift card on the same Amazon account that was used to place the order. This will be credited latest by September 30, 2016. No, you do not need a promo code. Just use your Visa card to make the payment at the time of delivery. Can I avail the Offer on more than one purchase? Yes, this Offer is valid for any number of purchases made during the Offer Period. You will get 10% cash back on all payments made using a Visa Card, subject to a maximum of Rs. 100 per Card. What is the minimum purchase that I need to do to avail the Offer? There is no minimum purchase to avail this Offer. You can avail a maximum of Rs. 100 per Eligible Card as cash back to your Amazon.in gift card account. What if I place the order during the Offer Period but my delivery arrives later? Can I avail the Offer? No. This cash back will be given only if payment is made using an Eligible Card for your COD orders during the Offer Period. What payments is the Offer not valid for? Payments made on Amazon.in website or mobile application are not eligible for this Offer. The Offer is also not valid for payments made using MasterCard, American Express, RuPay, Discover, Diners or any other credit / debit cards other than Eligible Cards. The Offer is also not valid for pin codes not eligible for COD or in respect of products not eligible for COD. What happens if I return the product I paid for using a Visa Card during the Offer Period? You will not be entitled to claim the Offer if you return the product.